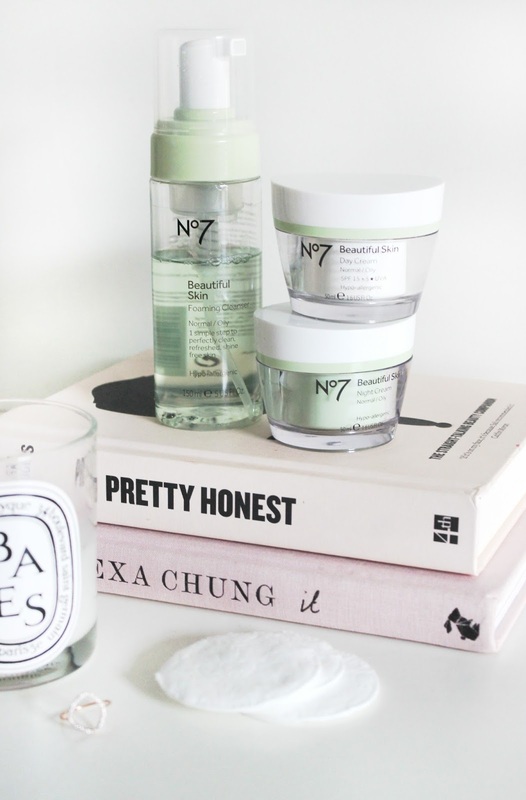 No 7 has been a brand that I’d always see stacked on the shelves at Boots but it was never one that I would go to – and honestly, I don’t really know why. I guess I always associated it with the slightly older working woman, not really a brand built around a girl in her mid-late teens, but I’ve really been getting into the brand lately and so I thought I should probably talk about it. My earliest memories of No 7 stem from my late Aunt’s makeup drawers, filled with little oval compacts with deep plum eyeshadows and gorgeous berry lipsticks (her favourite colour was purple). I remember her letting me give her a makeover with all of the products she owned and the majority of it was from No 7. More recently, I started taking Accutane again. My skin has been playing up a lot over the past year and right now it’s the worst it has ever been even though I’m well past my teenage years. You might know that one of the most common side effect of Accutane is actually dry skin… and I guess this time round, I was well prepared! I popped into Boots and asked for their best moisturizers, and I was immediately guided to the No 7 counter. Long story short, I left with three products – a day cream, a night cream and a foaming cleanser. I thought I’d talk a little bit about them today because so far, I’m really impressed. No 7 Beautiful Skin Foaming Cleanser – this is really light and refreshing to use, it really cleanses the skin and I love using it when my skin needs a quick cleanse. It takes about three pumps to have enough for one wash and you apply it on dry skin and lather it up before washing off with water. I think that I will switch to an oil based cleanser in the next month or so because my skin is going to get even more dry as the course of medication goes on but this is great for now. I’m really enjoying it. No 7 Beautiful Skin Day Cream – I’ve been using this so much and I can honestly say that it’s one of the best affordable moisturizers that I have ever tried. It’s hydrating, soothing (my skin is extremely itchy and red due to Accutane) and it calms redness down as quickly as possible. I know I’m going to look into the Dry/Very Dry skin formula the brand have next, but this will definitely be a ‘to repurchase’ product once I’m off the course of treatment. It’s just such a great moisturizer! No 7 Beautiful Skin Night Cream – again, like the day cream, this is very hydrating but less thick. I wasn’t expecting this because I always thought a night cream would be thicker and more hydrating than a day cream, after all, you’re not drinking water in your sleep and your skin needs to stay hydrated. Oddly enough, this gel formula is light but still packs a punch when it comes to moisture. The jars of moisturizer feel super luxe too, even though they’re both very affordable. If you can’t tell by now (I feel like I’ve just been singing praises but I can’t fault these, honestly), I love the few pieces that I have tried from No 7. I haven’t really tried much of their makeup, at least not on myself, nor much else of their skincare – but I look forward to trying out lots more soon. I don’t think the brand is talked about nearly as much as it should be – it often gets lost among reviews of more expensive skincare treats. But if you’re on a budget, or even if you’re not, I highly recommend taking a look at this range – it’s definitely a great one. Have you tried anything from No 7?